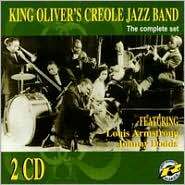 King Oliver, “King Oliver’s Creole Jazz Band: The Complete Set” (Challenge, 1997; tracks recorded 1923). This 2-CD set is a revelation. This is the best release I have heard of King Oliver's first recordings. It documents the beginning of King Oliver's and Louis Armstrongs recording careers. Covering the years 1923-1924, comes just 6 years after the very first jazz recordings ever made---you are travelling here to the very roots of Jazz. The sound on these CDs is remarkably vibrant and clear---the best treatment I have heard of any acoustically recorded music. Comparison with the other CD releases of the same King Oliver recordings reveals its superiority (although RealAudio compression muffles and distorts the sound, differences can be distinguished). The stunning thing in these recordings is the emotional and rhythmic intensity achieved by King Oliver's band. Canal Street Blues and Dippermouth Blues have a cathartic energy that I don't hear in other bands again until the advent of the Beatles and the Grateful Dead---it's King Oliver's on-the-edge soulfulness, something that is more than just the individual arrangements, musicians, and style of the time. And, man, King Oliver gets down! This music is funk. It's a far cry from the comic style that people associate with Dixieland. His later electric recordings show his funky vibe even more (the great sounding "Sugar Foot Stomp: King Oliver and His Dixie Syncopators" [Decca Jazz #616] is regrettably out of print).